MIREIA LOPEZ, VICE PRESIDENT HEAD OF ACCESSORIES AT BVLGARI INTRODUCES THE LATEST COLLECTION OF BAGS. Bvlgari’s accessories are instantly recognisable. Firstly because of their motifs and embellishments (the Serepenti and Monete for example have come to define the brand), but secondly for their bold and bright colour palette. Bvlgari designs statement pieces in colourful hues so the customer can dress according to her mood. So it is perhaps surprising then that the latest collection B.Glam, which will reach stores in spring 2019, is based around a line of black bags. 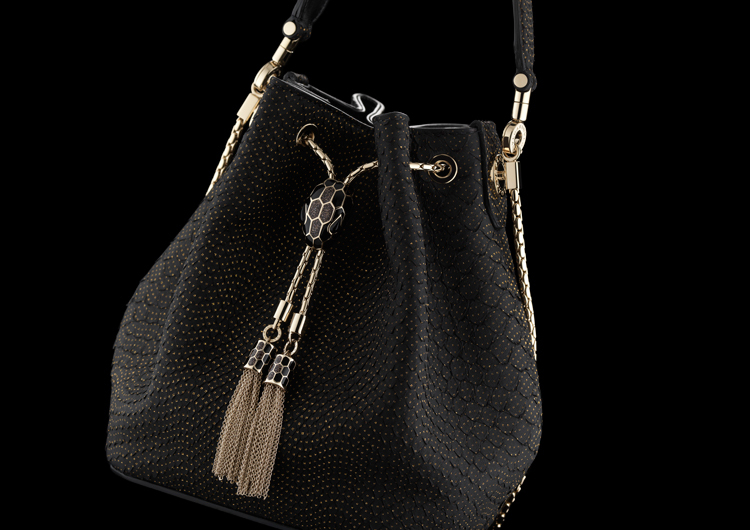 Within the collection you will find new takes the Serpenti bag. Designed as a collection for young women, B.Glam is a new direction for Bvlgari. To explain all of this, A&E talked to Mireia Lopez, Vice President Head of Accessories who gave an insight into the thought process behind the new direction. We heard that we are going to see something very different from Bvlgari next season – what can you tell us? The collection is very different because we are concentrating on the theme B.Glam. B stands for Bvlgari, for black or for just being yourself. It’s a collection through which we are trying to create more of an intimate relationship with our clients and I think it’s going to be really strong for the Middle East in particular. When you say intimate with the clients, how do you translate this into a bag? Intimate in the sense that we have unique pieces and we have developed a world around black. Black in the Bvlgari way. It began when we were thinking about the amount of time we spend with a black bag. Black is something that makes us feel comfortable and confident and we have the reassurance that it looks good with everything. Normally, as you know we do colourful bags, and we asked ourselves “how can we get more intimate with our clients?” In the sense that we want our bags to be worn every day or on more occasions, and we wanted to create something that goes with everything. So the collection is centred around black, but we couldn’t just do a black bag, it has to be a Bvlgari bag. Yes the colour is important but what is more important is the craftmanship. It’s about embroideries, chains, metal details and hand painted pythons. Which categories of bags will we see in this collection? You will see more across the Serpenti range because we are developing it with new shapes. We used to have our iconic Serpenti Forever bag, and this year we have introduced the Serpenti Diamond Plus, which is bigger and quilted. We are also introducing a bucket bag which has a softer shape. So we are developing Serpenti with more attitudes. Who is the woman you are designing these bags for? We are targeting a younger crowd but I think it is really about the attitude. We can think of a young client when we are designing, but it is more how a woman feels and how she wants to look than about her actually being young. And why young women for this collection in particular? When a girl grows up the first bag she buys is likely to be a black bag. Her first luxury will be something she can wear a lot. So we want to make the first luxury bag for a young client. The bags are for every day, but still very iconic. When we talk about black linked to practicality and functionality – how do you feel about the tote? It is something we are working on and I actually have a prototype. I think what we have is perfect but we are still playing around with the shape. We are working on it and I hope it will be ready by June next year. What are the challenges that you face to avoid repeating yourselves every season? We have a team of designers that are working all through the year. We have been doing a lot of capsule collections that include exclusive pieces that you will only find in certain places or at certain moments. So we are trying to follow moments that are meaningful to the client. For the new collection we briefed the designers to work on the iconic shapes but animating them so they look new. Hopefully this will bring variety, whether it’s in the colours, the craftmanship or both. And of course we have new shapes. So Serpenti has a new trendy shape in the form of the bucket and for next season we are making a bigger one. We are also going to be launching a belt bag in the spring. Do you think over communicating and over production on products kills the uniqueness and desire? Yes I think that we have to manage for longevity. We don’t want to overproduce, we don’t distribute outside our boutiques and we don’t do wholesale, so we are already controlling this. I think that things do change from market to market. Look at something like Chanel – you still see a lot of people wearing Chanel, but it is still very desirable and they seem to manage it well. It’s a tricky thing to find the balance of doing business while managing for longevity and keeping the exclusivity. We are doing a good job to identify how we can build the desire.